Before I started my own blog, the beer blog I frequently visited was Brewpublic. It introduced me to the people, places, and events that made up Portland beer scene. One of the names synonymous with that scene is Angelo. During the last 18 months, I’ve gotten to know Brewpublic founder, Angelo De Ieso, and have come to learn what many know as fact—Angelo is simply a great guy. You've been in Portland for 14 years. What part of the country are you from and what brought you to Portland? Angelo De Ieso: I am originally from New England. I spent most of my youth in Maine until I was 20. Then I moved to the Bay Area, living in Oakland and San Francisco. That move was on a whim to explore what the other side of the country had to offer. I moved to Portland in 1998 to find a better quality of life and attend college at Portland State University where I received an undergraduate degree in communication. I've never dreamed of leaving until now. Where you a craft beer geek when you moved here? AD: I was a casual craft beer drinker. My first memories involved the beers of Boston Beer Company and Geary's. My deeper passion for good beer was inspired by Lagunitas, Deschutes, BridgePort, and Full Sail. The first friend I made in Oregon, Shane Walz, really loved good beer and remains a homebrewer to this day. He really stoked the fire concerning craft beer for me. 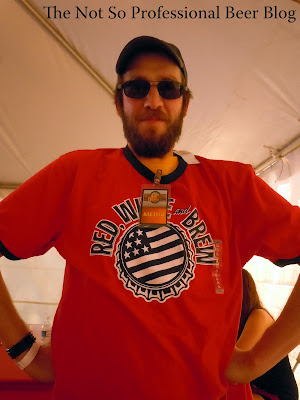 How long have you been writing Brewpublic and how did you decide to start the blog? AD: Brewpublic began in 2008 after doing a bit of work for other blogs and other publications as a freelance writer. My dear friend Aaron Miles, who I met at school while at PSU encouraged the idea of blogging independently and he has been a partner and supporter in the endeavor ever since. Looking back at the time you've been blogging, do you have 2 or 3 particular memories or experiences (resulting from the blog) that stand out? AD: I remember the first time someone recognized me for what I was doing. It felt really good to know that my support of craft beer and our community was getting some traction. Today I see how many more beer bloggers there are in this area and it makes me happy to know that others care, too. There are many memorable experiences that have involved traveling and meeting new people - brewers, publicans, beer drinkers, just people in general. I love people and I love learning new things every day. 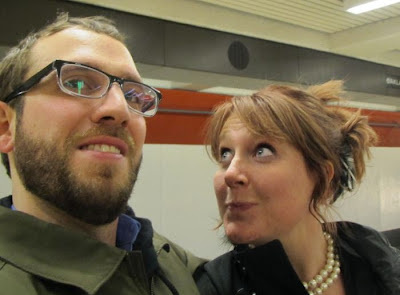 And, of course, I can not forget to mention my wife Ashley, who I met through the blogging world. She interviewed me for her blog Drink With The Wench and we hit it off right away. What will happen to Brewpublic now that you're leaving? AD: If I had a nickel for every time I was asked this question I'd be a much richer man. I am not sure. My purpose on earth extends much further than my blog, but I realize that Brewpublic has meant a lot to many people. I am really hoping to get more contributors to keep it going and encompass more of Northern California as well. A lot of what I will be doing will depend on time and realistically, finances. If anyone out there is looking to hire a talented craft beer mind with a lot of passion, knowledge, and love for the industry, please contact me! A huge congrats to you and Ashley on your marriage! How did you two beer blogging titans meet? AD: As previously mentioned, we connected through an interview series she does on her blog that features various bloggers. I met her briefly in passing a few times prior to that, not really knowing her too well. Once we finally met in person, we discovered a connection that we had that sparked the realization of a common goal to be healthier and happier people. We seem to give each other than push to encourage each other to be better and better. Since we've been married we've been living apart and this has been tough. So, as of today, we are planning on our lives together, and setting off on a wild journey that we anticipate leads us to realize so many new things in the world that we didn't realize before. I'm looking forward to the future together. The first time I looked into Ashley's eyes, I knew I loved her. Can you give us any hints about the your and Ashley's future beer plans? AD: I wish I had more insight on the future beer plans of mine. Right now I am leaving behind all that I know in Portland for a new and challenging world in the Bay Area. It's simultaneously scary and exciting. My ultimate goal is to help Ashley and Bison Brewing become as successful as possible. I really love the fact that Bison's owner Dan Del Grande is committed to sustainability and environmentalism. These are very important things to me. My goal is to be a part of something greater with Ashley and make a difference in my community wherever that is. While many of us are sad to see him leave Portland, I know we are thrilled for Angelo and Ashley and wish them the best for their new life together. I have no doubt that they will make a difference! Angelo should move to Northern Indiana or Chicago and get a gig as PR/MEDIA for one (or a collection) of the rising global stars of the brewers universe. Beer and Hard sh*t sector growing fast here.